2010-09-06: Second sock is done; both fit perfectly. Awesome. Quite a lot of leftover yarn though. 2010-09-04: First sock is done; there are 13 pattern reps and 12 rows of ribbing. I used the sewn bind off as explained in the book. The lace pattern’s not easy to memorize, but I had it by the end. 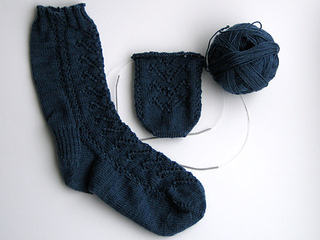 I thought I’d be “enh” about knitting the second sock (since I always hear that), but actually I’m enjoying the process. I guess something about tiny precise stitches appeals to my geeky nature. Yarn is “Lorna’s Laces Shepherd Sock Color Commentary Cookie’s Deep Dark Secret”, which is almost a solid but has occasional subtle variations. Trying the technique of using two circular needles (one 16” and one 24”), because I always seem to get ladders when I use DPs. I used “Judy’s Magic Cast On” as written out in the book. Took me a while to figure it out but the toe is amazing - so clean! Definitely like the toe-up method -- I tried it on several times while working on the foot and it fits perfectly. 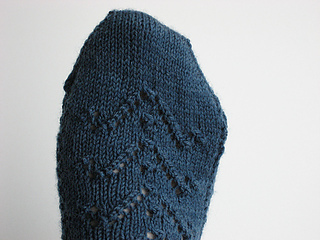 And the flexibility involved in working with two circulars made it really easy to try on, even when I was working on the heel.